The people in ancient Egypt divided Egypt into two areas: the ‘black land’ and the ‘red land’. The black land was the fertile land on the banks of the Nile, where the ancient Egyptians grew their crops. The red land was the barren desert that protected Egypt on two sides. These deserts separated ancient Egypt from neighbouring countries and invading armies. They also provided the ancient Egyptians with a source for precious metals and semi-precious stones. More than 94 percent of Egypt consists of desert areas. 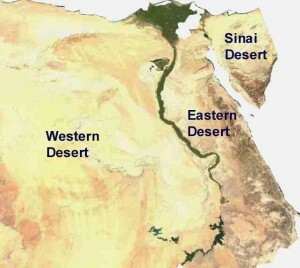 The Western Desert and the Eastern Desert are separated by the river Nile which flows from the Sudan and through the length of Egypt to the Mediterranean Sea. The Sinai Desert is situated on the Sinai Peninsula, in the easternmost part of Egypt between the Mediterranean and the Gulfs of Suez and Aqaba, both forks of the Red Sea. The climate of the deserts in Egypt is a harsh one. The desert areas don’t receive much in the way, nor rain nor moisture and the vegetation is almost non-existent. However, fertile and barren areas, sandy and rocky places, mountain peaks, caves and limestone sculptures modelled by the wind, stony and bumpy areas, the peace of the desert, palm trees, enormous sand dunes as far as the eye can see, are all aspects which can be found in the Egyptian deserts. There are people who associate the desert with boring and lifeless matters. However, people who have ever been to the desert are convinced of the very contrary. For generations travelers have been lured by the beauty and mesmerizing stillness of Egypt’s deserts, leaving behind the comfort of what is familiar in a quest for adventure, knowledge and escape to get a taste of eternity. The desert possesses a multitude of identities, a source of majesty and life-giving natural beauty, barrenness and yet incalculable mysteries. The desert in its boundlessness and utter unpredictability shatters all our notions of time and holds out the offer of an intensity of meaning and renewed self-awareness that is as irresistible as it is rewarding.